Which NRC Data Would Be Most Valuable to You In Open Format? For many years, the NRC has been recognized for proactively making large amounts of data and information available to the public through its website and the Agencywide Documents Access and Management System (ADAMS). But until recently, this data has been available primarily on HTML web pages or embedded within PDF documents. As a result of President Obama’s Open Government Initiative, the NRC, along with other federal agencies, has begun to make more of its data available in open formats that are machine readable. The use of open formats makes it easier for members of the public to access, use, and combine the data for their own purposes. Until now, the NRC staff has selected datasets for publication based on institutional knowledge and other information such as the most popular pages on our website. As a result of these efforts, the agency has published more than 20 datasets that we believe are of high value to the public. 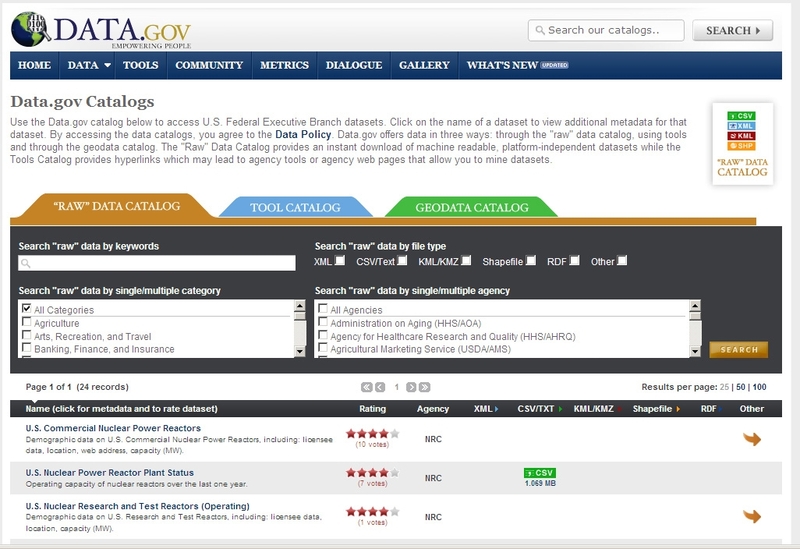 You can see these datasets at our Open Government page and at data.gov. Some of the datasets have generated a large number of downloads while others have not. You can get the download statistics on our Open Government page (click on NRC High-Value Data-Set Metrics). As you can see from the last column of this spreadsheet, the average monthly downloads currently range from 11 to 94, with the Nuclear Power Reactor Status Report scoring highest. In the future, the NRC would like to publish datasets based on your input and interests. With that in mind, our question to you is this: Which datasets would be most valuable to you? Publishing takes resources. By expressing your views, you can help the NRC direct those resources towards publishing the data-sets with the most value to the public. Please provide your answers in the comments section of this post. We look forward to getting your input! I’ve been happy with the turnaround for comment approval here. Additionally, I foresee legit reasons this blog in particular would have a comment approval step – although I do not mean to imply your rejected comment fits this. That said, you should always record the comments you’re making for personal reference anyway, I have never seen a blog that gives notifications when a comment is not approved (although I would appreciate it myself). It is dangerous for a blog owner to not approve comments, some other bloggers I know will later post their unapproved comment on their blog and tell the world that it was not approved. This is your best recourse if you think your opinion was unfairly judged. Why even write anything under this heading when the NRC moves it to the waste basket open comments assuming your too stupid to know where you want it. I thought the deal was they were going e-mail you if they had a issue with your comment…a misunderstanding…or a chance to let you fix it. I say again, it is not about moving the known recorded data and information around so it is better understood…it is fundamentally about the quality and detail of the information they give us. You may request older documents found on ADAMs that are in microfilm format only. Last week I needed a copy of NUREG/Cr-5164. I emailed my request and received a free paper copy delivered to me in less than 5 days. You can contact the Public Documents Room Staff from the ADAMs web-site. where electric generation and other statistics are maintained for U.S. nuclear power plants. Thank you for taking the time to send your suggestions. We require licensees to provide effluent reports annually. These reports can be found at http://www.nrc.gov/reactors/operating/ops-experience/tritium/plant-info.html . However, there are no regulatory requirements for licensees to submit the other data you’re seeking, and we don’t foresee expanding NRC reporting requirements in a way that would address your request. We should note that licensees are required to make reports if any regulatory limits are exceeded. The NRC maintains a list-serve system with a number of lists the public can subscribe to, including News Releases. You can sign up on our Subscribe to E-mail Notices page here: http://www.nrc.gov/public-involve/listserver.html to receive all News Releases or just those concerning licensed facilities in certain regions or geographical areas. At this time, we do not offer a subscription service to Event Reports, but we agree that it would be good to have one. We are looking into it based on your suggestion. We also agree that RSS feeds would be a good way to go and we are planning to implement them at a future date as part of a larger redesign of our public website. We agree that it would be good to have more of our older information in an electronic format that could be viewed online. These older records are stored offsite in paper form. When NRC staff members require the older records for their work, we recall them from storage and digitize them. We’re currently storing about 50,000 cubic feet of paper records offsite, a subset of which is the original paper from which the microfiche was made. While we would like to do more, at this time, given current resources, we are able to digitize only about 200 cubic feet of records per year. I’d like to see more of the older documents available for download (as pdf files). I’m very interested in things that happened long ago and most of the documents are available only in microfilm. I have tried to prowl data.gov before, and as someone interested in nuclear power data I was relatively disappointed. I’m very happy to now see attention being paid to this. Looking so far at the data you put up, capacity factors over time and startup date, etc all constitutes information I already had access to. That said, if I were to need this data I would prefer your format in Excel and the clean organization. It gives power status for each reactor, for each day, and archives give it as far back as maybe 10 years, I don’t remember exactly. Please please please upgrade the quality and format of this data. Fundamental information like capacity factor is available through the IAEA and PRIS database, but data demands for research are always increasing and daily and hourly data are of increasingly high value. The French electric power industry is standard setting for data availability. I hope this is helpful. My focus is specific to certain areas, as is true to everyone interested in your data. But I just want to say that a clear format making all of the above data available for the US nuclear fleet would be unique in the world and would improve the reputation of NRC oversight. Obviously, these are all extra-mile kind of things, but offering it anyway provides additional value and piece of mind to the public. On top of that, it opens up all kinds of possibilities that we can’t think of ourselves. I would like to see an RSS news feed for NRC news events and U.S. nuclear plant events. It would be nice to separate the rad health events from the nuclear plant events. An RSS feed reader like Google Reader makes keeping up with everything so much easier than having to go to a web site manually and looking for what has changed. You have the info available now to do it. Just one more step to do RSS feed(s). Thanks for listening. I know NRC tries very hard to provide info and does an excellent job.